The Lord explains to us how the Church grows with the parable of the sower. The sower sows and the seed grows by day, by night… - God gives the growth – and then the fruit is seen. But this is important: First, the Church grows in silence, in secret; it is the ecclesiastical style. And how is this manifested in the Church? By the fruits of good works, so that the people see and glorify the Father who is in heaven, Jesus says. 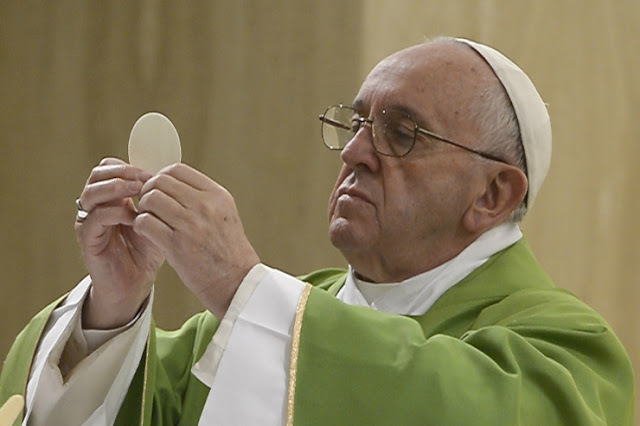 And in the celebration, the praise and the sacrifice of the Lord – that is, in the Eucharist. There the Church is manifested: in the Eucharist and in good works. The Cross and suffering. The Church grows also with the blood of the martyrs, men and women who give their lives. Today there are many [martyrs]. It’s strange; they don’t make the news. The world hides this fact. The spirit of the world does not tolerate martyrdom; it hides it.